Senator Eyinnaya Abaribe and two others who stood as sureties for the leader of the Indigenous People of Biafra, Nnamdi Kanu, are yet to pay the N100m bail bond they were ordered by the Federal High Court in Abuja to deposit in the court’s bank account in November 2018 less than a week to the expiration of the two-month ultimatum given to them to pay the money. The three sureties rather than depositing the money in the court’s bank account as ordered by Justice Binta Nyako on November 14, 2018, filed separate appeals challenging the court order on Monday, January 7. Justice Nyako had ordered Abaribe, Tochukwu Uchendu and Emmanuel Shallom Ben to pay the money due to Kanu’s persistent absence from court since October 2017. Abaribe’s lawyer, Chukwuma-Machukwu Ume (SAN), also confirmed that his client had yet to pay the money. Ume explained that the lawmaker could not pay the money because he had filed an appeal against the court order. Shuaibu Labaran, the prosecuting counsel, also said he was not aware that the sureties had complied with the court order. “I am not aware that they have complied with the court order by paying the money. I have been served with their appeals.” Labaran said. A copy of the five-ground notice of appeal filed by one of the sureties, Uchendu, contending among others, that the court order directing the sureties to pay the bail bond to the court’s bank account “was in obvious error”. After being granted bail by Justice Nyako in April 2017, the IPOB leader went missing after soldiers invaded his house in Afara-Ukwu, Umuahia, Abia state. He only resurfaced about a year later (October 2018) in a viral online video showing him to be praying in Israel. Legit.ng previously reported that the Abuja Division of the Federal High Court ordered Senator Eyinnaya Abaribe and 2 others who stood as sureties for the leader of the Indigenous People of Biafra (IPOB), Nnamdi Kanu, to within two months, account for their inability to produce the missing Biafran activist in court. 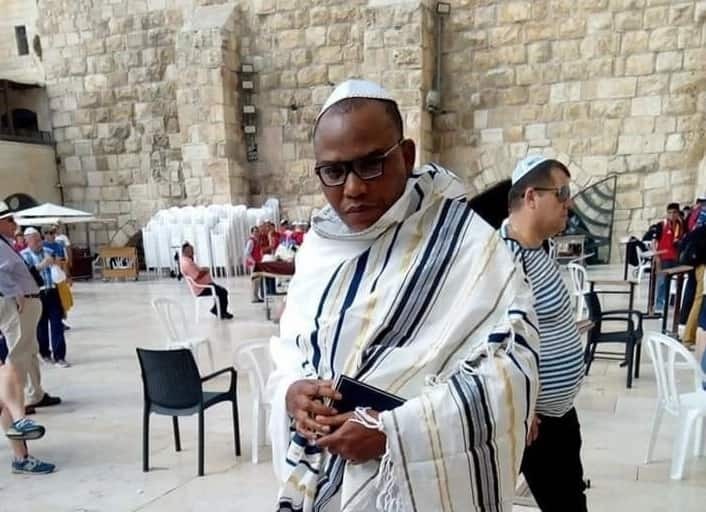 Apart from Abaribe, two others who stood surety for Kanu were a Jewish priest, Immanuel Shalom and an accountant and Abuja resident, Tochukwu Uchendu. The court on Wednesday, November 14, also varied the bail condition given to Kanu in his trial for alleged treason, threatening to order the arrest of a senator Abaribe and another surety who undertook to produce Nnamdi Kanu ahead of his bail in April, 2017.